Daniel Whitten died on duty in Afghanistan. The sister of an Iowa native who died in Afghanistan is also in the military –and is on a tour of duty in Afghanistan Twenty-eight-year-old Army Captain Daniel Whitten was killed Tuesday when an “improvised explosive device” struck his vehicle. He was a 1999 graduate of Johnston High School. His sister, Sarah Whitten, has also attained the rank of captain and she is also serving in Afghanistan according to a statement released this morning by the military. 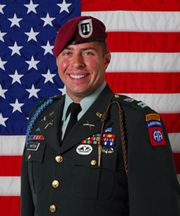 Daniel Whitten was in the midst of his third combat deployment. He’d been to Afghanistan before, in 2007, and to Iraq in 2005. Whitten’s mother, Jill Whitten, lives in Grimes. His father, Dan, lives in Florida. He is survived by his wife, Starr Whitten.